The Touchstone Online Course and Online Workbook are components of Touchstone Blended Learning. The Online Course is a fully digital version of the Touchstone series including a mapped version of all the classroom materials for online self study supplemented by collaborative learning tasks and tools. 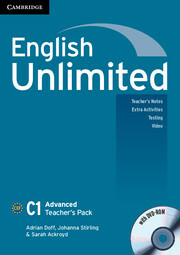 The Online Workbook supports the Online Course or can be used independently with other print materials. The course is delivered in the Cambridge Learning Management System. The materials include presentation videos, such as presentation Flash movies designed to teach grammar, Speaking naturally and Conversation strategies. There are thousands of interactive activities and integrated collaborative tasks for completion in LMS tools (Voice Tools, Forums, Blogs and Wikis), games, projects, tests, etc. The materials are mapped exactly to the classroom content through the same learning outcomes in order to facilitate the implementation of flexible blended learning. Touchstone is a motivating with rich content including video, audio and a wide variety of activity templates. Great dynamic web 2.0 content such as wiki's, blogs and forums. Full reporting and monitoring for students, teachers and institutions. Complete assessment package including objective and portfolio testing. Online teacher product training module.